A beautiful rooftop garden has popped up on top of the Queen Elizabet Hall at Southbank. Watching out over the veges is the ever so scary scarecrow. Somehow I think the veggies will be safe Mo, I wouldn't come anywhere near them with at scary thing around haha! I'm certainly staying away, and I'm not even a crow! That is one decidedly aggresive looking scarecrow! Do birds read facial expressions? Looks like he got his pullover from Michael Crawford in 'Some mothers do have 'em'. Birds should definitely be scared! Yes, I think the garden is charming. 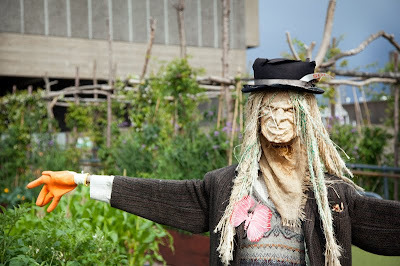 the scarecrow seems too urbane and worldly wise for my taste - a bit like one of those ageing rock stars. Whoa! Big budget here. Looks like they hired the make-up artist who worked on Michael J's Thriller video... hehe. Great scarecrow. What a fun pic!